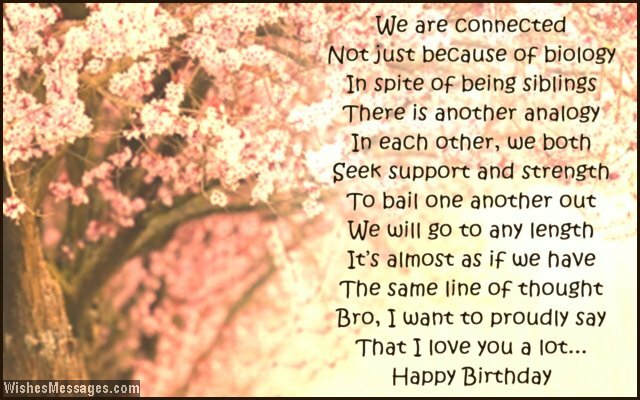 Birthday Poems for Brother: All your brother’s friends are going to wish him a Happy Birthday by sending sweet texts, cute Facebook posts, funny quotes and messages on WhatsApp. How are your wishes for your bro going to be different from the lot? Take ideas from this post to write your own short poem on a lovely little handmade greeting card. It doesn’t matter whether you are no longer the peppy sibling pair that you once were as children. No matter where life takes you and no matter who you are with – the special connection with your brother is a bond that will never wither away with the sands of time. Regardless of how old you are, your brother’s birthday is the perfect opportunity to cherish some of the beautiful childhood memories.